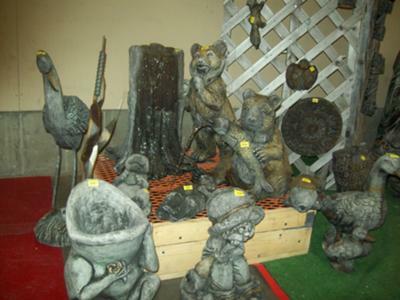 I make cement yard sculptures for yards and gardens in a variety of shapes and forms from fish, herons, rabbits, bears, moose, deer, flower pots, fountains, stepping stones. Should you want something unique, feel free to contact me with your design information and we can go from there. I will travel up to 75 miles one way. Please email for more info. Read our event liability insurance guide or find local arts and craft shows including county fairs and festivals plus state fairs. Also, browse our vendor classifieds featuring cargo trailers for sale including used utility trailers and heavy duty enclosed trailers for sale. Also browse our used carnival rides and midway carnival games for sale by owner.